On Monday, Russian diplomats celebrated a holiday that most people outside of the Russian Federation will not have heard of — The Day Of The Diplomatic Employee. As part of the celebrations, Russian Foreign Minister Sergei Lavrov lauded what he said were Moscow’s extensive diplomatic triumphs in 2013, including the prevention of Western military intervention in Syria and the agreement with Iran. “Today, solving any problem in any area can be done only through compromises based on a balance sheet. And this is a principle of our foreign policy, it is not yet put into service by everyone, but we strongly promote it and it has more and more supporters,” Lavrov said. 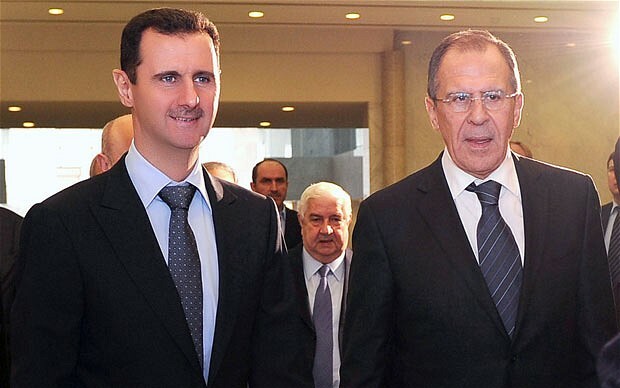 Whatever Lavrov’s opinions — be they spin or genuine — regarding a foreign policy based on “compromises based on a balance sheet”, in reality Moscow’s diplomatic efforts to support its ally, the Assad regime, have followed consistent parallel paths, regardless of the truth behind these paths. Calling for the “moderate opposition” to step forward and work with the regime on dealing with the “foreign terrorists”. COMPROMISES ON A BALANCE SHEET OR EFFECTIVE, CONSISTENT PROPANGANDA? As Lavrov praised Moscow’s “logical” foreign policy efforts, his colleague Alexey Borodavkin, Russia’s Permanent Representative of the Russian Federation to the United Nations Office was putting Russia’s foreign policy into action, criticizing the Syrian opposition for its unchanged position during the Geneva II peace talks. “Achieving this goal has failed. A delegation that is is part of the National Coalition opposition and revolutionary forces of political parties and groups came to Geneva II. This is regrettable,” Borodavkin said. And the fact that radical Islamist groups fired at the convoy and even fired on civilians evacuees, confirms once more the fundamental truth that the moderate opposition and the Syrian government must unite for a joint struggle against terrorism in the country. “As far as we know, the Government delegation headed by Foreign Minister Walid Muallem of the Syrian Arab Republic considers this problem as a priority at the Geneva talks,” he added. Russian Foreign Ministry spokesman Alexander Lukashevich also took the opportunity to turn the attacks on the Syrian Red Crescent aid convoy in Old Homs into a soundbite blaming “terrorists”. We regret that during the humanitarian operation (in Homs) there have been cases of ceasefire violation by the militants, resulting in at least five people being killed and 20 injured. Such actions are seen as an attempt to disrupt this humanitarian action and create an unfavorable background around which began on February 10 in Geneva, the second round of inter-Syrian direct talks. We are convinced that addressing humanitarian issues in Syria should be carried out in on comprehensive basis, devoid of political overtones and in accordance with international humanitarian law and the statements of the President of the Security Council on October 2, 2013. In the final analysis, whether or not one agrees with Lavrov’s declaration that Russia’s foreign policy over the past year has seen “triumphs” in Syria, it is impossible to deny that Moscow has been extremely effective in bolstering the Assad regime, even as the US has stepped back from supporting the insurgency. The only question now, as talks resume in Geneva, is whether countries such as France are able to push hard enough to counter Russia’s “triumph”.